In this method, a variable resistance (Rx) is inserted in series with the motor circuit. As this resistance is inserted, the voltage drop across this resistance (Ia Rx) occurs. This reduces the voltage across the armature. 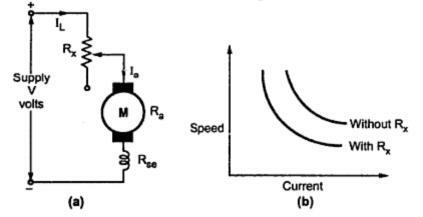 As speed is directly proportional to the voltage across the armature, the speed reduces. The arrangement is shown in the Fig 1(a). As entire current passes through Rx, there is large power loss. The speed-armature current characteristics with changes in Rx are shown in the Fig 1(b).